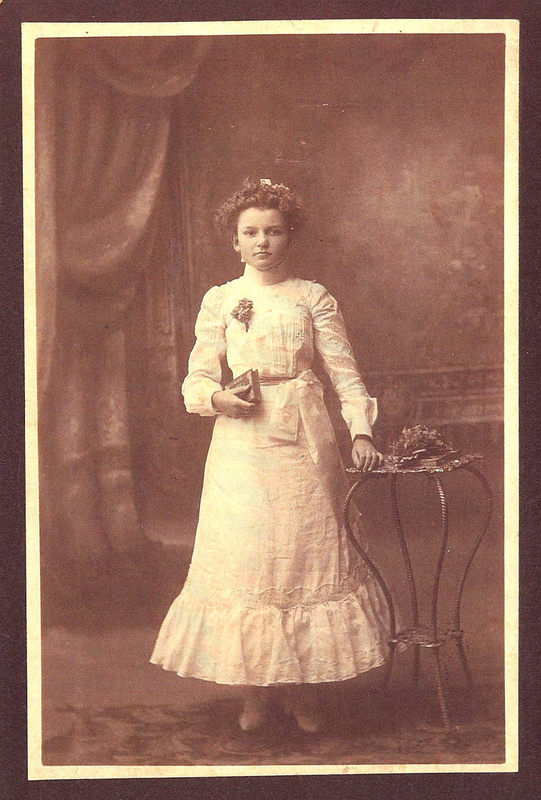 Unknown girl, from pile of discarded photos in Woodruff, Wisconsin antique store. In an antique store in Woodruff, Wisconsin, I came across a little album of autographs. 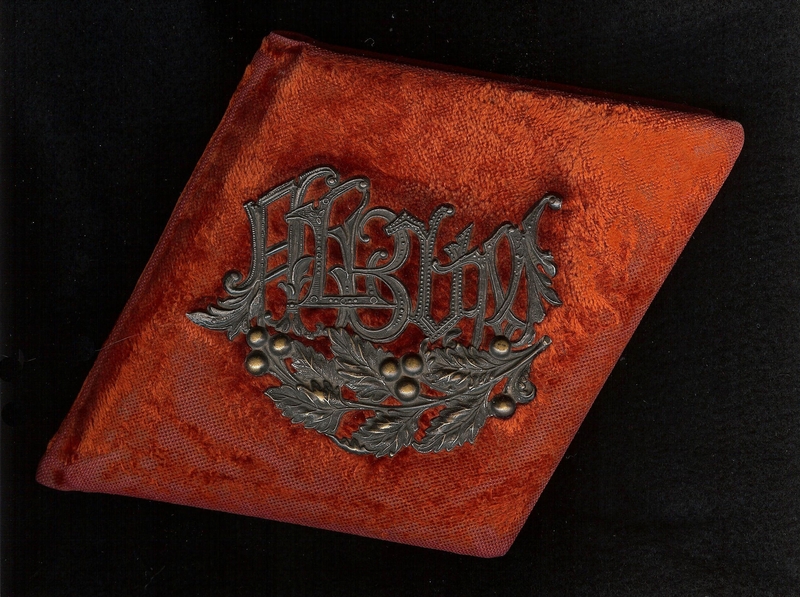 It had a well-worn velvet cover, and its contents told me that it was the property of Emelia Daw (nee Buchert), who received it in 1890 at the age of 15 years. The last signature is in 1930, when Mrs. Daw (as she is addressed in the later salutations) would have been 55 years old… the same age I am now. In the corner margin, she wrote: “Remember the pantry jokes”. Salt in the sugar bowl? What mischief did they cook up?! I brought the album to the Chicago Botanic Garden, where I am teaching a class in calligraphy. 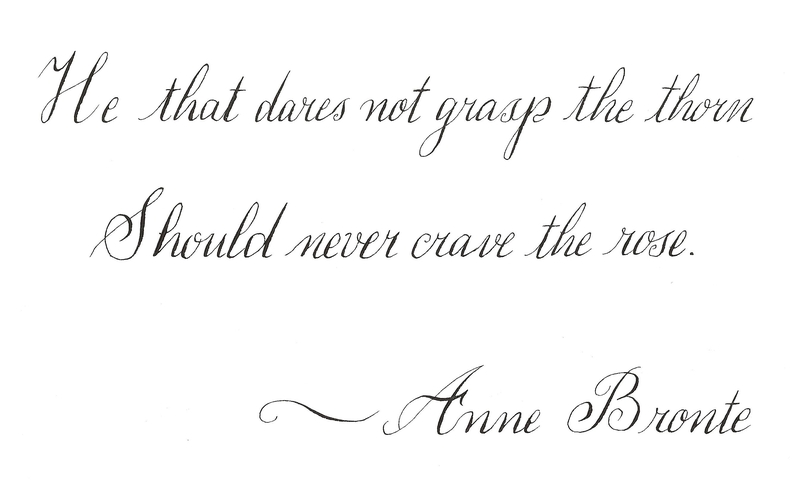 My students were fascinated with the beauty of the penmanship. The writers used quill-shaped pens dipped in ink bottles, similar to the ones we use in class. 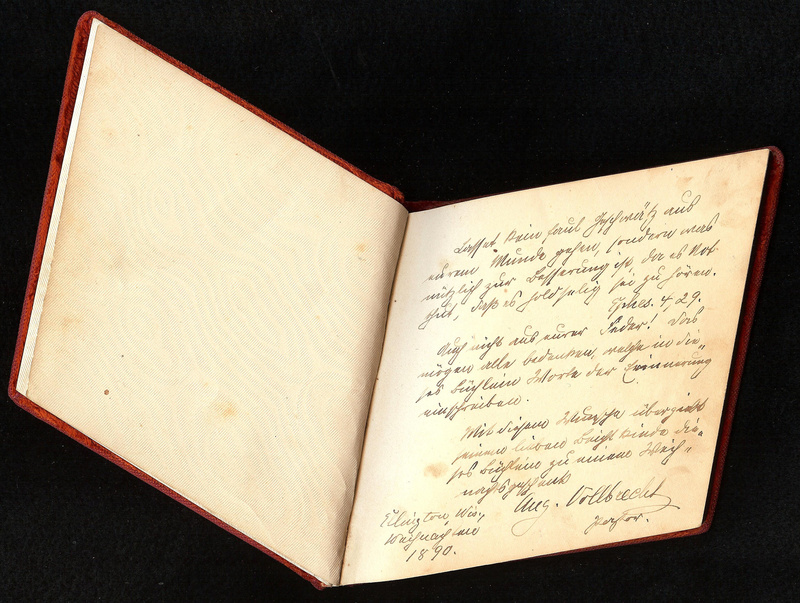 As the years went along, the writing became less formal, resembling Palmer cursive hand-writing. One imagines that the manner of dress and speech also became less formal, as these German immigrants adjusted to their life in America and things became more modern. Today, we can compose and publish with no pen, no paper, and no pants on. They had names like Alma, Anna, Elsie, Hermann, Otto, Hazel. They came from Wisconsin towns called Bancroft, Ellington, Hortonville, Greenville, Washburn, Appleton, Watertown and Stevens Point. I think Emelia came from Hortonville, which made me laugh, because Hortonville was always my family’s synonym for “Nowhere” after our car broke down there on a family road-trip. Each of the inscriptions, with its ornate calligraphy or pencilled scrawl, conjure up a personality. One can almost hear their voices. As a person who embraces the fluidity and ease of technology, I find that calligraphy brings a slow pace and tactile quality to writing that is all but lost today. In the careful forming of letters, the scratch of pen on paper, the setting-up of ink between two scored lines from a metal pen, the content of the inscription (whether it be a saccharin couplet in an autograph book or a literary quotation) becomes a separate concern. 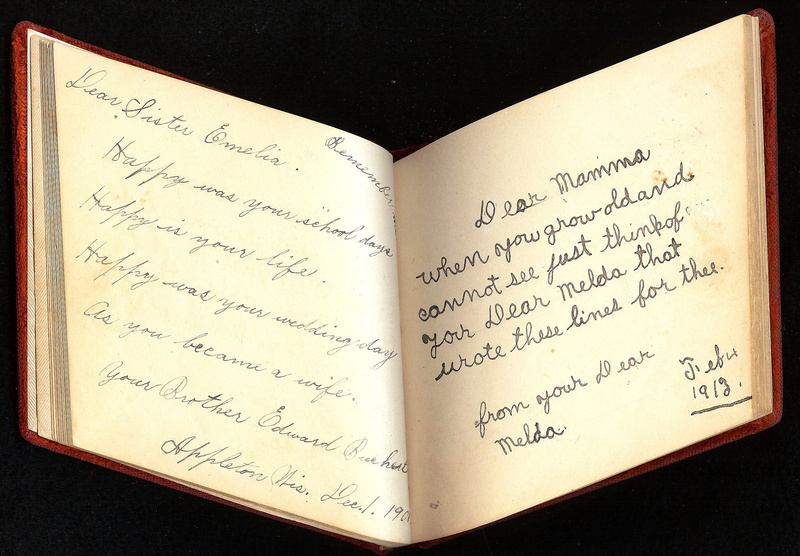 For Emelia’s friends, their inscription showed their devotion; writing was their gift. 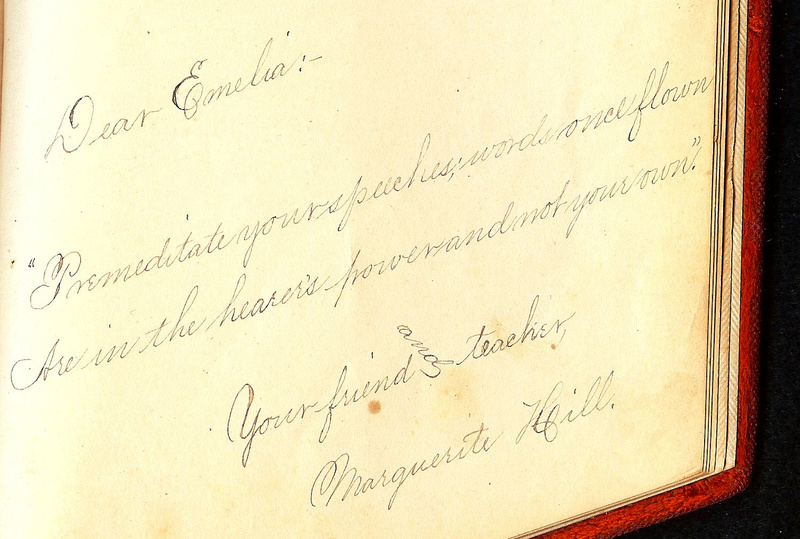 It humbles me that Marguerite Hill, Emelia’s “friend and teacher”, wrote better than I do, and she wrote that way ALL THE TIME. “I am totally captivated by the beautiful, challenging art form of Asian brush painting. ‘The rhythmic ritual of grinding my own ink feels very meditative. It prepares me to paint with a certain calm and presence, while connecting me to the daunting knowledge of a ritual that was practiced 4000 years ago. ‘The spirituality of Asian painting is an inspiration in its reverence for nature, from the most imposing mountain to the tiniest insect. It is permeated with a spirit of gratitude– starting with the ink, brushes and hand-made papers. It is said that an old brush is never thrown away, but reverently buried. Reggie is a friend of mine. In the spirit of this blog, I have been helping her prepare for a solo exhibition of her paintings this summer, providing “technical support for a creative life.” This took the form of designing her postcard and business card, photographing her work and digitally correcting the photos, uploading her work to a website, providing editorial feedback on her artist’s statement and bio, etc. As I listened to her read her artist’s statement, I was struck by the dignity and beauty of her words, and how these qualities are mirrored in her paintings. 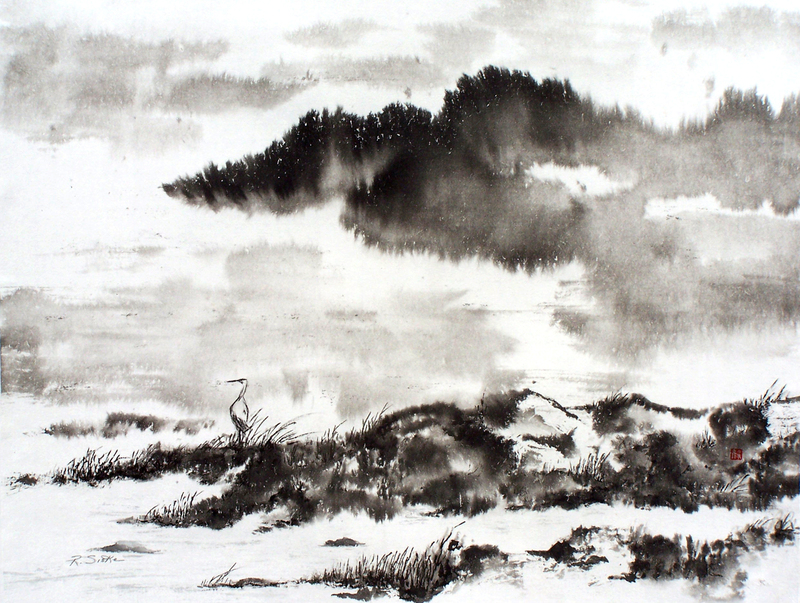 In an elegant way, she describes the humility and reverence with which one approaches Asian brush painting. As a Hebrew calligrapher whose work is also tied to an ancient tradition, her words resonated with me. For years, I refrained from signing my ketubahs (decorated Hebrew marriage contracts). I felt that I was a link in a long chain of scribes who wrote Torahs and other sacred texts, anonymously. 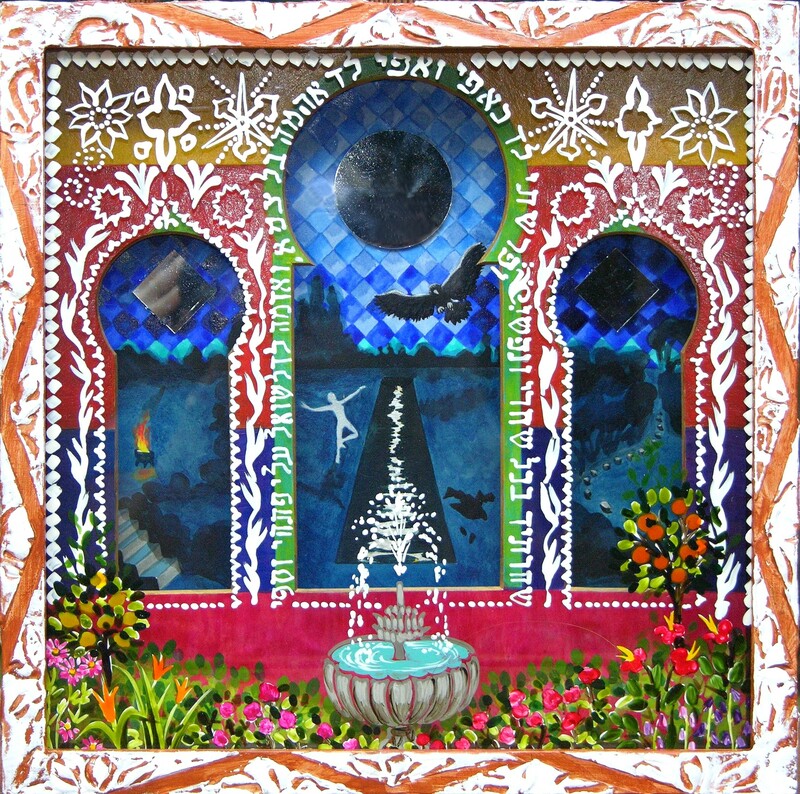 The ketubah isn’t a sacred text; rather, it is a contract and a work of folk art, and eventually I put my stamp on it, creatively and appellatively. More significantly, Reggie made me think about the contrast between an artistic tradition based on humility and gratitude, rather than ego and self-promotion. As I work to make a living as an artist, I need to “get the word out” about my work. Additionally, one of my professional gigs is art coach, to help others promote their work. There is nothing wrong with all this horn-tooting, but at times it still makes me cringe. I keep coming back to the bedrock of all this activity: it is all about the work. In other words, if we just put the work out there, it will speak for itself. And, conversely, no matter how much hoopla we make, if the work isn’t speaking to people, all the noise will fall on deaf ears. 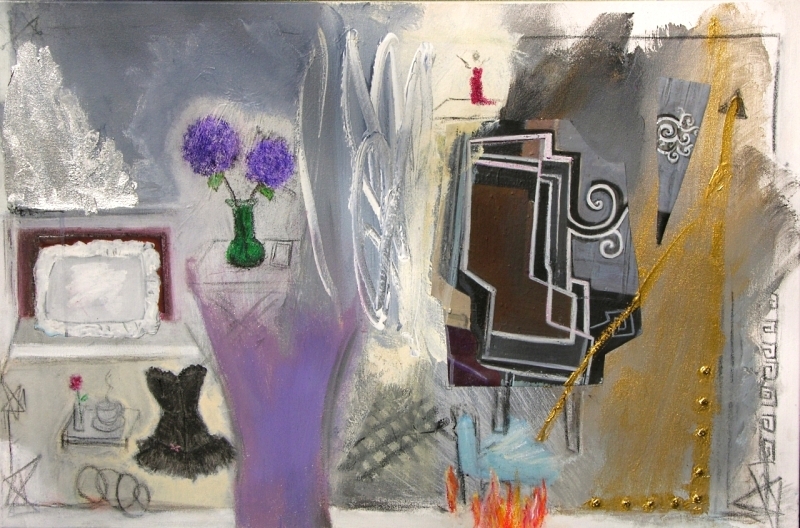 I think you will agree, when you regard Reggie’s work (above), that it speaks with a strong, gentle, lovely voice. See more of Reggie’s work at her website, and August 5-30 at the Wilmette Public Library, 1242 Wilmette Avenue, Wilmette, Illinois. Opening reception: Friday, Aug. 5, 6-8 p.m.